San Diego hit a soft patch. Home sales volume sales of single-family homes slowed in October 2013. However, flippers did well during this period. Partially because house flippers don't need to be as concerned with the long-term trajectory of a housing market. In 2013, the percentage of flipped homes dropped, which scared off some investors. But those who stayed in found the market exceeded expectations in upswing. Two years ago, the San Diego housing market hit a soft patch that likely did not register on the radars of most casual market observers, but it drew the attention of some housing data geeks. “I had very savvy investors tell me a couple of years ago to stop buying houses because everything was going to fall apart,” said local real estate investor Justin Williams, who runs the investor coaching website houseflippinghq.com. Williams said he and his team have flipped more than 500 houses since he jumped into real estate full-time eight years ago. What did those savvy investors see in the data? First, home sales volume slowed. In October 2013, sales of single-family homes and condos declined 4 percent annually following 21 consecutive months where home sales volume was flat or increasing on a year-over-year basis, according to RealtyTrac public record sales deed data. The 4 percent decline in October was followed by five consecutive months of double-digit percentage decreases in home sales volume. Second home prices softened. Although average home sale prices continued to rise annually in the metro area, they declined on a month-over-month basis for three consecutive months starting in October. It was the first string of three consecutive monthly declines in home prices since the three months ending in October 2011. Read how seven San Diego real estate investors are making money flipping and wholesaling. This soft patch in San Diego — which was masked by continued double-digit percentage increases in average sales prices that only later slowed to single digits in April 2014 — can probably be chalked up to a rise in interest rates. 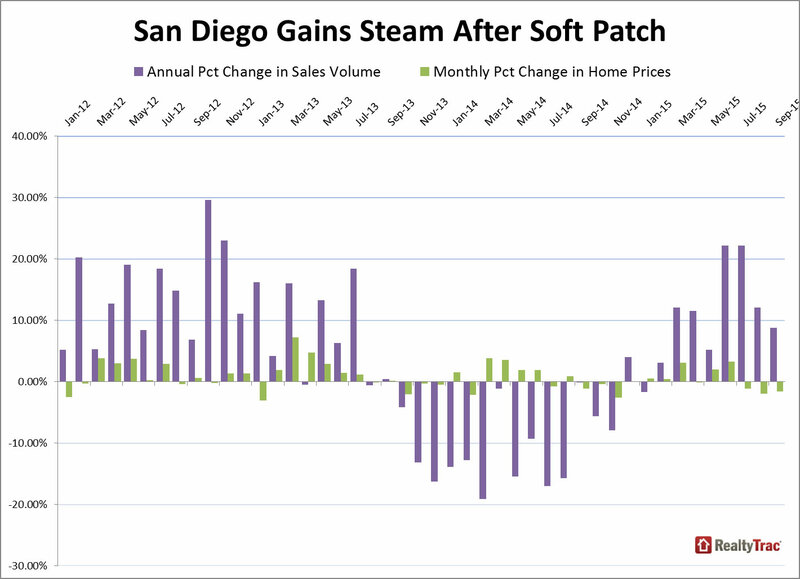 This soft patch in San Diego housing was masked by double-digit increases in average sales prices. The average 30-year fixed mortgage rate crept above 4 percent in June 2013 after 19 consecutive months below that milestone and was up to 4.49 percent by September — which in hindsight turns out to be a 50-month high. But in the face of this softening market and advice to the contrary from other investors, Williams did not panic — he continued to buy and flip homes. He’s now quite happy about that decision made two years ago. Can you “time” the real estate market? Robert Campbell says yes. 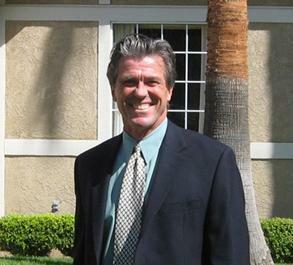 San Diego-based real estate analyst and author Robert Campbell, who produces data-heavy reports available at realestatetiming.com designed to help real estate investors and homeowners time their buying and selling in local housing markets, agreed that house flippers don’t need to be as concerned with the long-term trajectory of a housing market. “Theoretically flippers can make money in good markets and bad because they are so close to the market … and their time horizon is six months … and typically things don’t change that much in six months,” said Campbell. Because the soft patch in late 2013 didn’t metastasize into a full-blown housing downturn in San Diego, Williams and other flippers did not have to deal with the added stress of a depreciating market. That was a welcome relief to real estate investor Doug Van Soest, who cut his teeth in real estate investing in Southern California in 2008 and 2009 when prices were plummeting and foreclosures were flying high. Van Soest noted that the more steady and stable market in San Diego and other parts of Southern California has reduced competition from other flippers afraid that the market was crashing again or just not content to operate in a more slowly appreciating market. 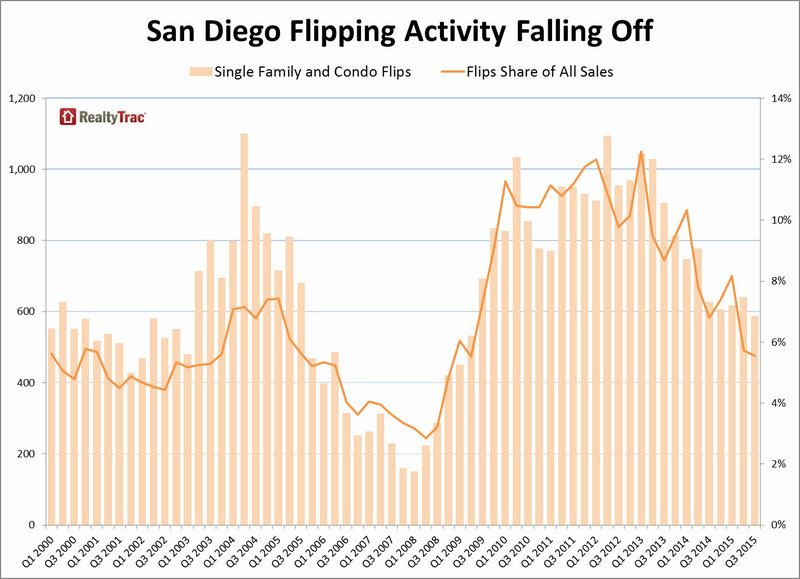 Data from RealtyTrac shows flippers have curtailed their activity in San Diego over the past two years. Between the first quarter of 2010 and the first quarter of 2014, flipped single-family homes and condos accounted for 10 percent or more of all sales transactions in all but two quarters with a peak of 12.2 percent in the first quarter of 2013. In 2014 Q1, flipped single-family homes and condos accounted for 10% or more of all sales. But in the second quarter of 2014, flips dropped to 8 percent of all transactions — down from 10 percent the previous quarter — and continued to decline from there. In the third quarter of 2015, homes flipped in San Diego accounted for just 6 percent of all sales, less than half the peak from 2013. Investors who have already pulled out of the San Diego market did so prematurely, according to Campbell, who said that his market timing data does not show the San Diego market as a sell — yet. Read how San Diego flippers are riding the real estate investment wave. Campbell acknowledged that San Diego’s market upswing has exceeded even his expectations. “I thought we would have a trend reversal in maybe the second or third quarter of this year, and that’s not the case,” he said. He explained that his real estate timing index for San Diego has only had three “signals” since 1995: buy in December 1996, sell in August 2005 and buy again in April 2010. Which housing markets will become unaffordable if interest rates rise?